Will Trump Get Away with All of It? The good news for Trumptarians is that Donald J. Trump is not going to be legally impeached, indicted, removed from office or otherwise until his protectors and enablers are weakened first: Congressional Republicans. And they won’t be weakened until mid-term elections in 2018. In “Washington time” that might as well be the next century. As far-sighted Democrats build political strategies to get elected in 2018, the ever so expeditious GOP-Trumptarian wrecking ball swings 24/7 dismantling the structure and fabric of America. By 2018, there might not be a Beacon on a Hill to uphold, leaving only a sovereign America First molehill owing $20 trillion in national debt and $13 trillion in consumer debt. Such is the cost of Empire so far. It is always possible that one or two or even three House and Senate Republicans vacate their seats for reasons of health, for example, and are replaced by Democrats to upset the GOP’s carefully crafted though slim majorities that for now have rode out moderate Republican dissenters. But attrition applies to judges too, especially the oldest sitting members of the Supreme Court – Ginsburg, Kennedy, Breyer. The oddmakers call for a right-leaning packed Court lasting generations. The Trump-dyed imprint being left on this nation, with or without him staying in power, isn’t going to come off with Clorox. As things stand, unless stricken by heart failure or an act of God, Trump is here to stay. He is beyond the law because Republicans have blocked enforcement of it, or reversed it. If Mueller gets too close he’ll be fired. If Trump shoots people on Fifth Avenue, he’ll remain immune from prosecution until he leaves the Oval Office. 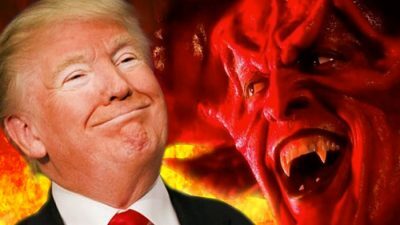 If he cuts deals with the House of Saud, launders billions through his properties and off-shore investment vehicles, accepts payments from foreign governments, or drops sulphuric acid on the Guttenberg Bible, Trump will never be wrong. Only a psychopath with extreme NPD who is a chronic liar, cheat, thief, misogynist, racist, racketeer, deceiver and manipulator is wrong, never Trump. Also, as the Lord’s personal envoy sent to save America how could he ever be wrong? If that day does arrive when Trump is prosecuted his defense attorneys will file an “insanity defense” and Trump’s luck will save him yet again; and that same luck, he’ll hope, will continue to save him until his very last day, his last throw of the dice, his last attempt to cut a deal – the day he faces the Book of Life. Hear now his plea and petition at the gate of St. Peter, who by now has become so sicken by what he read he recuses himself. Then the Lord enters, but not the one believed unto by the righteous of the day. Then Trump’s life review commences … then the weeping and gnashing of teeth begins … the wailing and beseeching … the bargaining, bartering, haggling … finally the verdict. Trump is sentenced. The new land he finds is filled with joyous souls who cannot be shaken by impostors. A land where all is transparent and no lie or deception can be hatched. A society where money is non-existent and without winners and losers. A land where perfect justice is bestowed; where no one can cheat or steal another’s place and receive only what they have merited. A place beyond death that annuls violence or the murder of another. This was Donald J. Trump’s sentence. Not into the eternal flames by an avenging God, but into a personal Hell of realizing all that he did wrong by witnessing all that is right. Geneva Sands, “Meet the 9 sitting Supreme Court justices”, ABC News, May 29, 2017. James Downie, “How GOP gerrymandering is protecting Trump”, Washington Post, May 19, 2017. Philip Bump, “The one little number that — so far — is all the protection Donald Trump needs”, Washington Post, May 12, 2017. Steve Liesman, “Household debt just surpassed the record level reached during the 2008 financial crisis”, CNBC, May 17, 2017.